The Deco Leaf is a lively appliqué when a little extra flourish is in order. The outlining offers some height and texture and makes the design pop. Imagine it in your favorite autumnal hues or paired with the perfect flower. The petal shape has many possibilities as an appliqué. Circle five or six leaves to make a flower, create adorable animal ears or how about a bird wing? It’s all up to your imagination. This three page pattern includes a helpful diagram for your crocheting ease. This purchase is for the Deco Leaf only. It does not come with the leaf pictured here. This pattern is copyrighted and for your personal use only. The Deco Leaf may be made and given as a gift, but the pattern may not be reproduced for use by others. 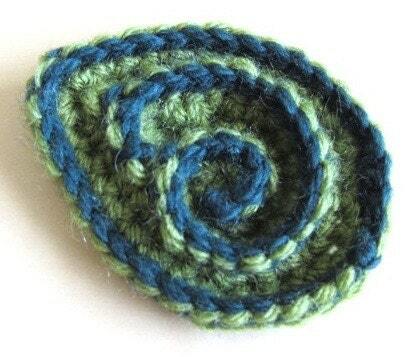 I hope you enjoy crocheting the Deco Leaf!